Watching the news can make it easy to think that people are inherently selfish and hopeless, but every once in a while there’s a story that proves that good people do exist! When the Curiosity Mars rover got lodged helplessly in a ditch, a complete stranger leapt into action and brought the module to safety. Simply incredible. Faith in humanity restored! At around 4:30 p.m. EST last Friday, the Mars rover was performing a soil analysis as scheduled when it moved too far forward and listed into a ditch. The next breathless moments in mission control were spent trying to maneuver the rover back to safety, but it soon became clear that it could not get out on its own power. Hopelessness began to set in. Then something amazing happened: An unidentified man selflessly rushed to pull the Mars rover out of the ditch. This nameless hero didn’t stick around for glory or a reward after making sure that the rover was all right; he just continued on with his day. 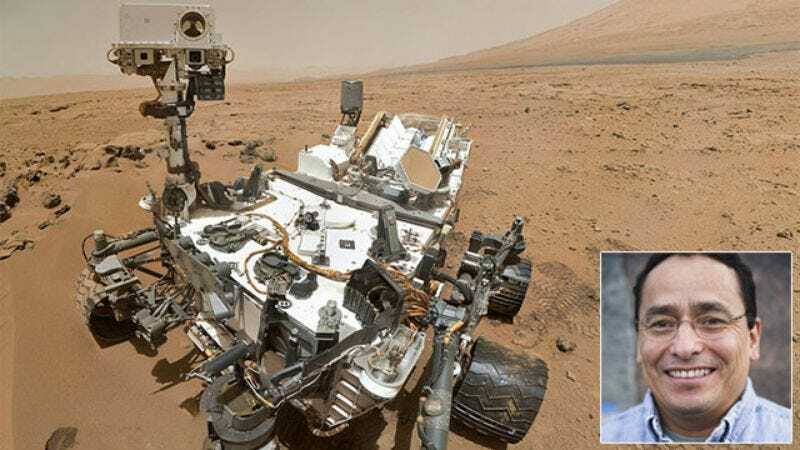 Due to the 14-minute transmission lag from Mars to Earth, by the time Curiosity’s camera could be turned around to identify the man, he was long gone. The $2.5 billion machine was in peril 140 million miles from Earth, but thanks to one incredible good Samaritan, the mission is back on track! Thanks to this anonymous knight in shining armor, the Curiosity rover can continue its important search for evidence of water and micro-bacterial life on Mars. NASA salutes you, and so do we!